Time is money and therefore traffic in heavy industry moves fast. 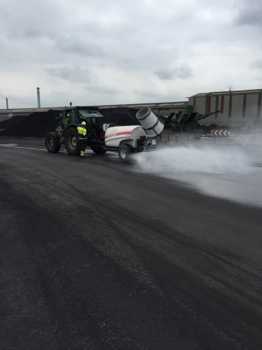 This fast pace effects the condition of roads on various industrial sites and results in the need for ongoing daily maintenance to keep roads operational and safe. The weight and speed of machinery causes degradation, washout, potholes and dust emissions that are not only harmful for onsite staff but most importantly unsafe. Most companies solve this by using water, lots of water, which is labour intensive and costly but above all can cause unsafe situations. Road dust solution is a biodegradable additive that binds dust to almost any kind of soil including paved roads. This stabilizes the surface and absorbs new dust particles.